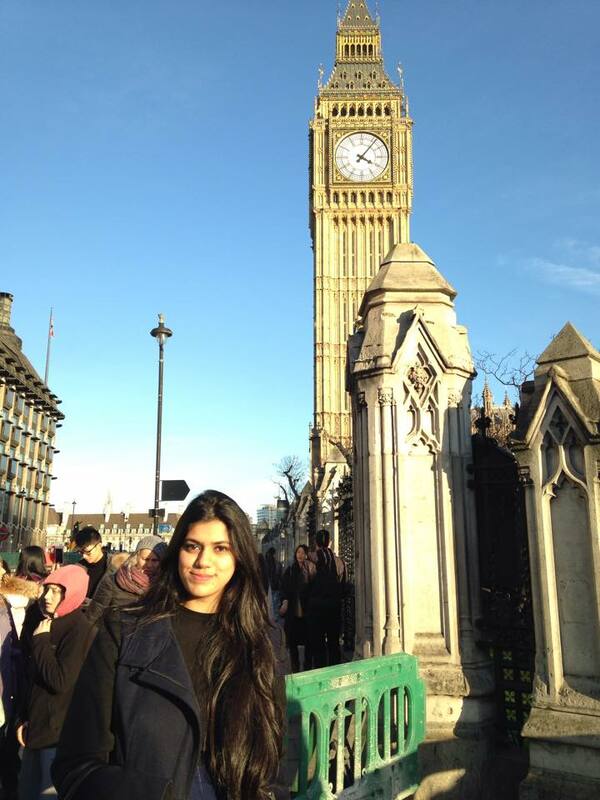 As it’s my reading week at University I went down to London to visit my oldest friend Raveena. She studies Culinary Arts at the University of West London and has been smuggling me in and out of her accommodation for the past week. I booked a bus with Megabus for £13 from Liverpool to London and back. Although the price was great the bus left at 5am and the 6 hour journey consisting of baby’s crying and slipping in and out of consciousness against a heavily vibrating window. However I arrived alive and well at Victoria Coach station in London at 12:30pm. One long overdue reunion with Rav later and we went about sorting my Tube transport for the week. I ended up with a weekly pass (Oyster card) which cost me £47 including the deposit for the card. We decided to spend my first day doing touristy things and first on our list was Buckingham Palace! We got off the tube at Green Park at the central line and found the gates of Buckingham Palace were crowded with policemen on horses. They were overlooking eager tourists surrounding the gates of Buckingham Palace. We didn’t know what all the fuss was about but the flag was flying, indicating the Queen was home. Not wanting to miss anything we stayed and waited for something to happen. After plenty of pushing and shoving between people we heard a policeman call out that there had been a delay and for crowds to move from the area. So we walked around and took pictures outside the palace before making our way towards the memorials at Green Park. Just before crossing the road an ordinary looking white car drove past us and into Buckingham Palace- with Prince Harry in the back seat! 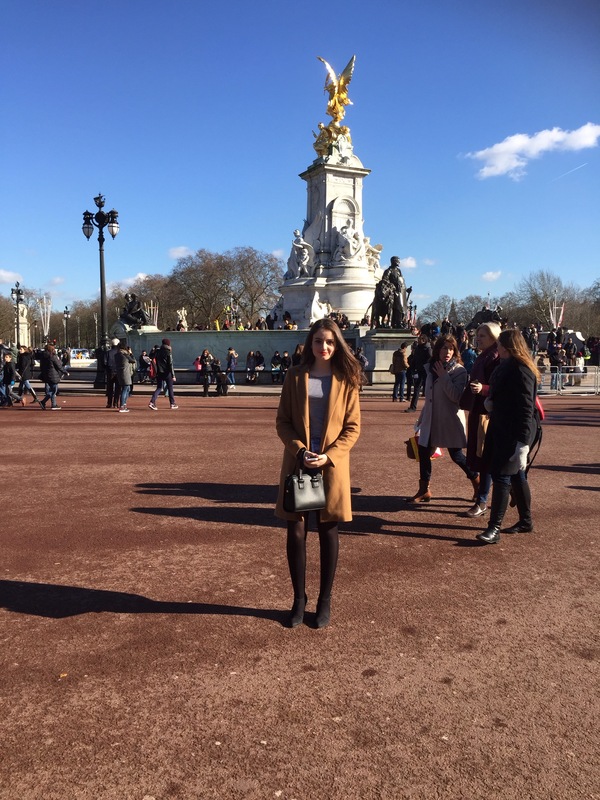 It was Ravs first time seeing Buckingham Palace, we couldn’t believe we actually saw a royal! Star struck and convinced we were one step closer to becoming princesses we walked through Green Park, the smallest of London’s eight royal parks, where we came across memorials and statues. 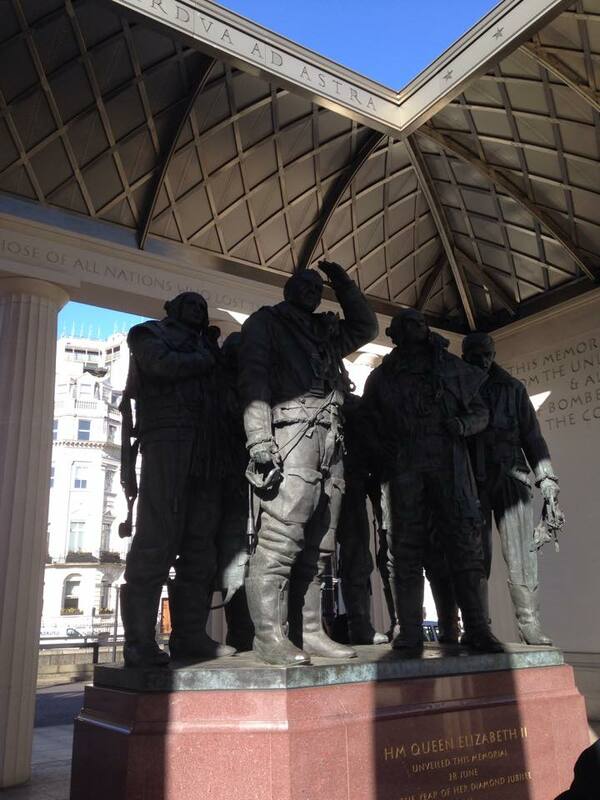 The Bomber Command Memorial commemorates the 55,573 who died while serving in the Bomber Command during the Second World War. It was designed by architect Liam O’Connor and built using Portland stone. 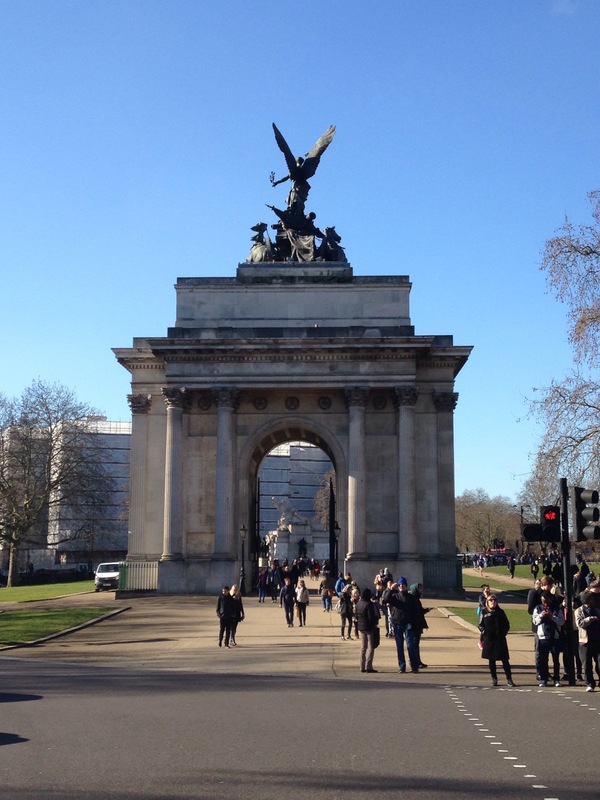 At the end of the park stands a victory arch, called Wellington Arch, proclaiming Wellington’s defeat of Napoleon. 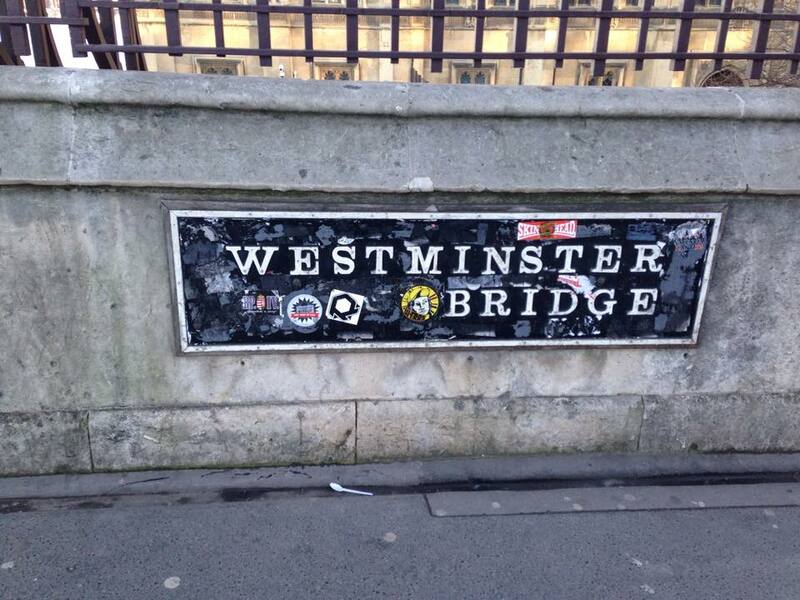 It is a landmark for both Londoners and visitors. 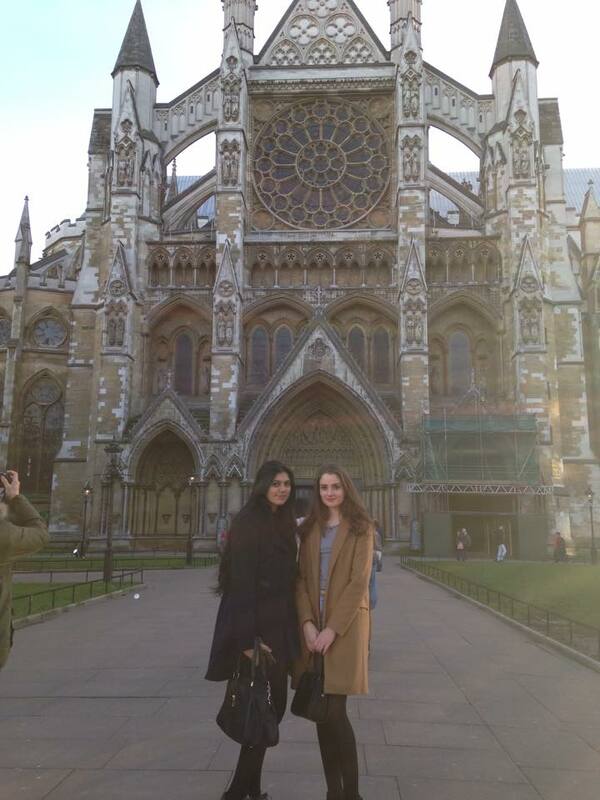 We went on the District line next and got off at Westminster, the home of Parliament and a popular area for tourists in search of Big Ben, The London Eye and Westminster Abbey. We were really lucky it was such nice weather, which actually lasted a few days, it’s as if London knew I was coming! 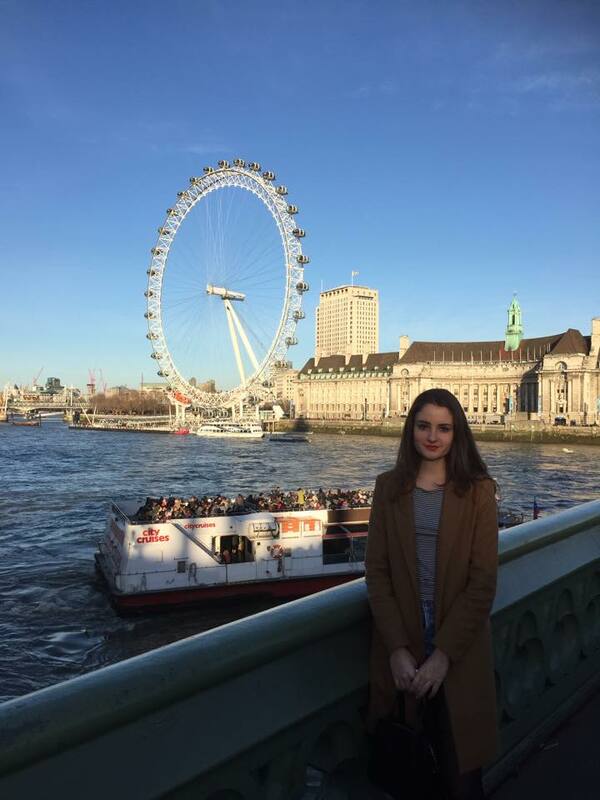 We didn’t go on the London Eye due to lack of funds (Student problems…) so we opted for touristy snaps and selfies! 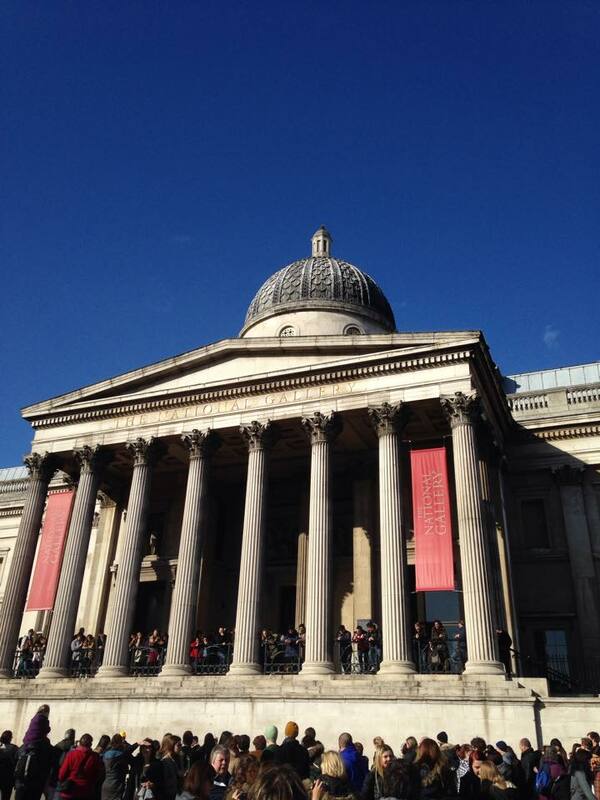 We also went to the National Gallery located in Trafalgar Square, also in Westminster. Trafalgar Square is a landmark in central London that is enjoyed by Londoners and tourists who often take photos sat on the squares famous Lion statues. I went to the National Gallery for the first time with my father, back when I took art at school. It was my favourite subject and I loved everything to do with it at the time. Having been to London’s Tate Modern, and thoroughly enjoying my time there, the National Gallery was a big contrast. I remember thinking all the paintings would be hundreds of years old and would bore me to death, then I realised it was home to two of my favourite painters; Claude Monet and Vincent van Gogh. 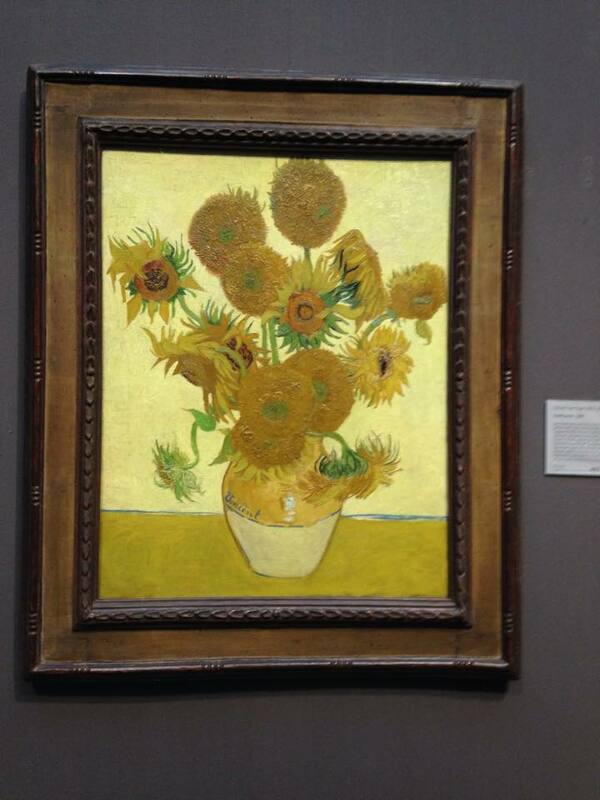 Van Gogh’s famous Sunflowers hang in the museum’s 18th- to early 20th century gallery. It dates back from August/ September 1888 and is my favourite of van Gogh’s paintings as it was one of the first paintings I saw as a child that introduced me to art. The good thing about the National Gallery is that it’s free. Although tour audio guides are available for £4 and maps of the museum are £1. We finished the day with a delicious meal at a German pizza, pasta restaurant called Vapiano in Oxford Circus. 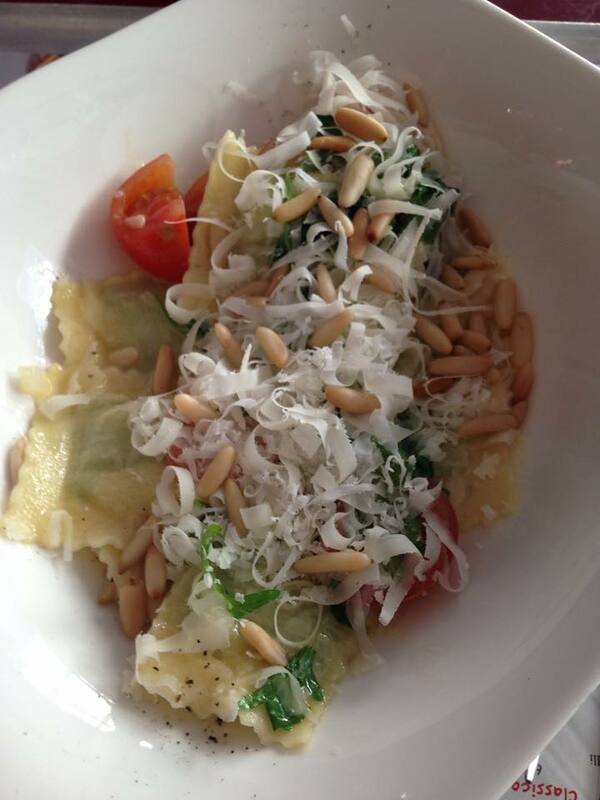 I ate their rucola ravioli, which consisted of homemade ravioli with a ricotta cheese filling, butter, rocket, pine nuts. After my first bite it quickly became my new favourite dish, and it was only £8.95. While in London we also visited the world famous Harrods. 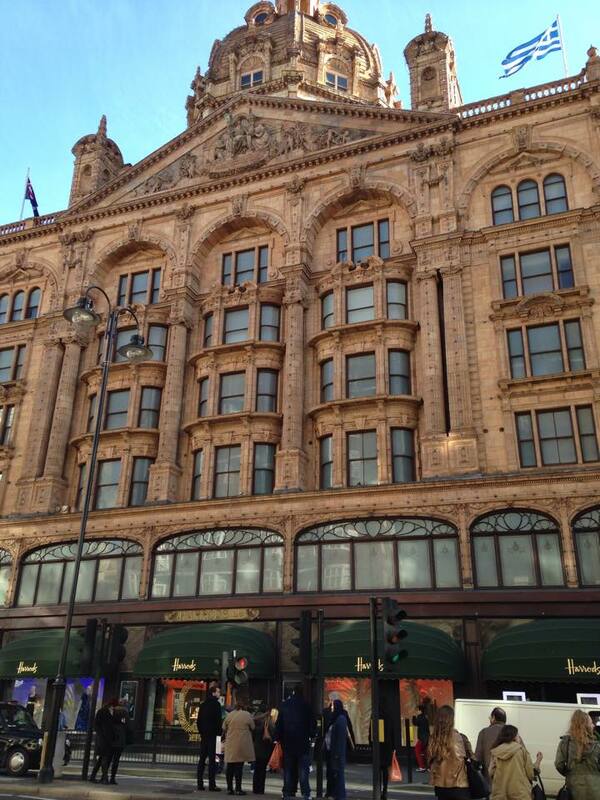 Which is the largest upmarket department store in Europe, located on Brompton Road in Knightsbridge, London. Harrods boasts seven floors and 330 departments that showcase the best of luxury merchandise, from high-end fashion and accessories to the finest homewares and the latest technology. Harrods has a Left Luggage office in the lower ground floor where you can check bags for £3 meaning you can shop without lugging around all your belongings. Amongst all the designer products and quality branded clothing was our favourite part- the food hall! The food halls at Harrods look like beautiful Victorian museums although maybe more fun as you can actually eat the things you are looking at! The food halls also have a number of counters where you can watch your food being prepared before you eat it. Rav and I waltzed through the hall staring desirably at all the treats we saw, wishing we could afford everything our eyes landed on. 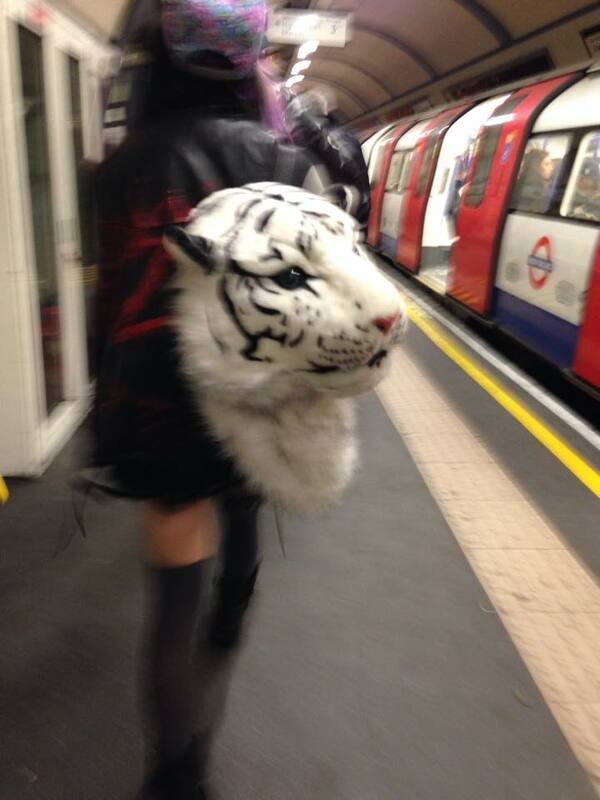 During the week we ventured out to the famous Camden Town on the Northern line of the underground. In contrast with Harrods’s elegance and luxury, Camden was a sea of entertainment filled with all types of people from all walks of life. Camden is difficult to describe as its streets must be seen in person, but it was definitely one of my favourite places in London. Camden high street is lined with amazing shops, pubs, small indoor markets, and restaurants which overflow into the side streets. Days in Camden seem to start slow as shops and stalls open around 10am until around 6pm, although some traders do stay open later. Camden Lock is the market that started it all in back in 1972 with a bohemian collection of outdoor stalls selling esoteric bric a brac. Now its indoor and outdoor markets still offer a huge selection of original arts and crafts, original designer clothes, delicious food stalls and boat trips along the canal. 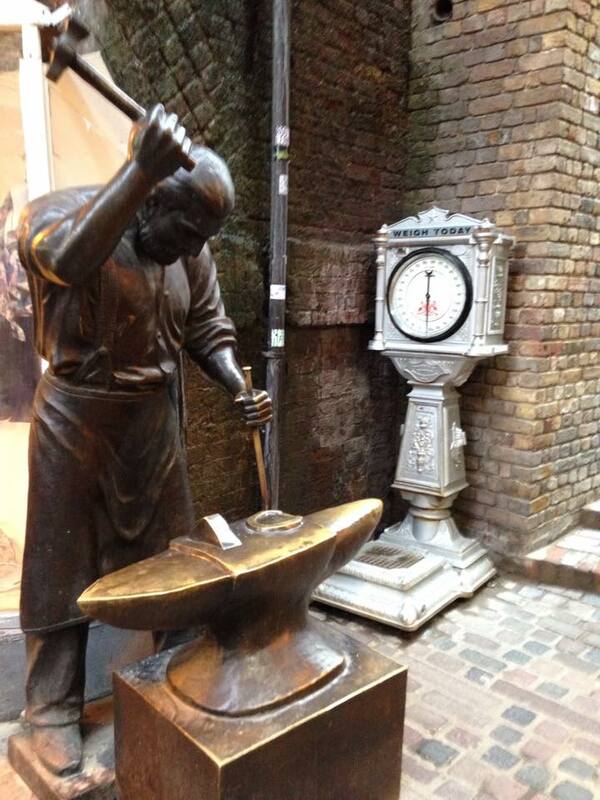 A great atmosphere – it’s the jewel of Camden. The Lock’s famous food stalls are to be found in Camden Lock Market, by the canals on the weekends, although they are open during the week. A huge selection of exotic foods are cooked in front of you by experts on stalls in West Yard. Helpings are huge and prices are very reasonable. Tables and chairs are provided but we enjoyed our meal sitting by the adjoining canal and watched the residents of Camden go by. Here’s a picture of my stilton burger- it was delicious! A place you could easily waste an entire day in is Camden’s Stables Market. It would however be a day well wasted, in fact you could probably spend a whole day there and still not see everything! 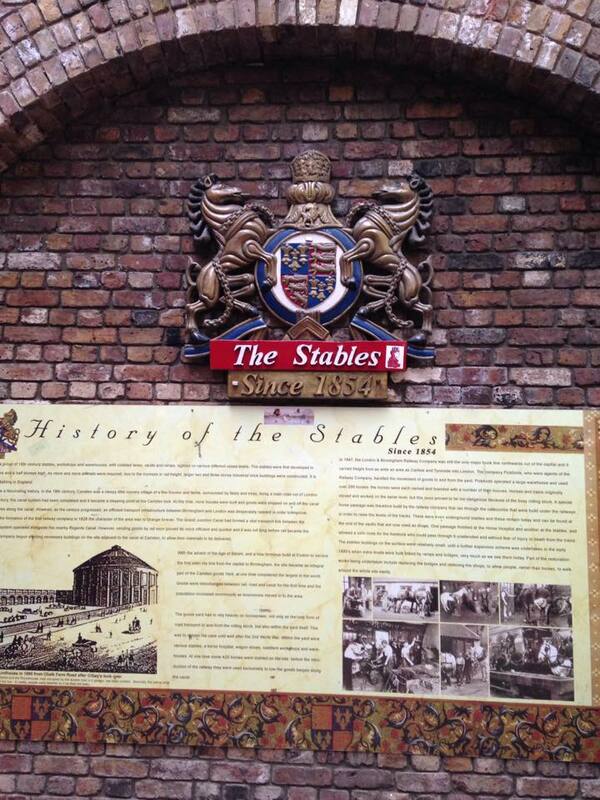 The Stables has over 700 shops and stalls that trade every weekend and many during the week. This market is unique as it appeals to all types of ages and tastes. Ranging from eccentric fashion to some of the best vintage shops to grace London. It is definitely one of the most unique places I have been to, with personality and creativity bouncing off its cobbled streets. The Stables also offers a huge choice of hot and cold food from many units with mini-kitchens serving cuisine from countries all over the world. Here’s Camden’s market website: http://www.camdenmarket.com/ As well as being great for shopping and eating, the Stables is worth a walk around just to see. Statues and art lie in and around the market, there is even a sculpture made to commemorate the late singer, Amy Winehouse near her last home. On one of the more wet days during my trip, Rav and I went to a popular restaurant, The Breakfast Club on Liverpool Street to eat. The idea was to go for breakfast however there was an hour long queue outside for a table and we ended up waiting an hour and having lunch! Thankfully it was well worth the wait. 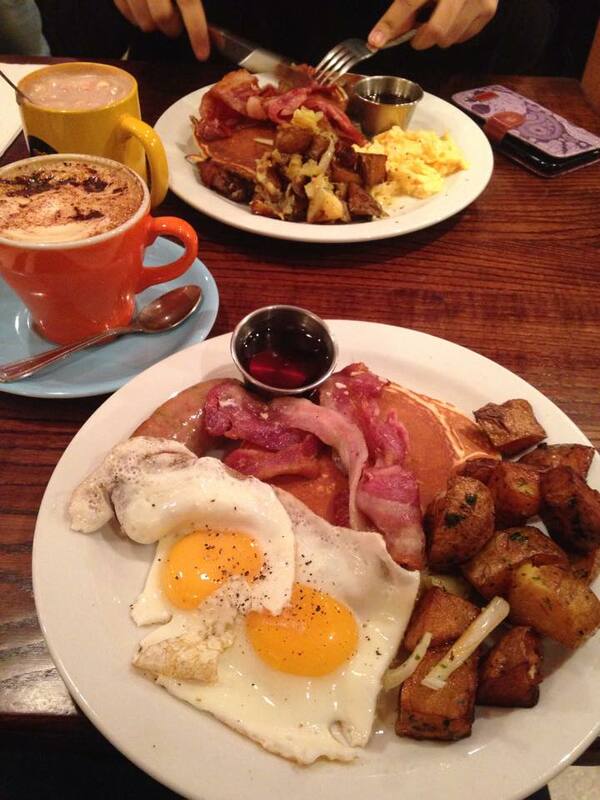 We both ordered the All American which consisted of pancakes, eggs, sausage, home-style fried potatoes, streaky bacon and maple syrup for £10.50. As we were on Liverpool Street we went to see some of London’s most famous and iconic buildings such as the record breaking Shard. 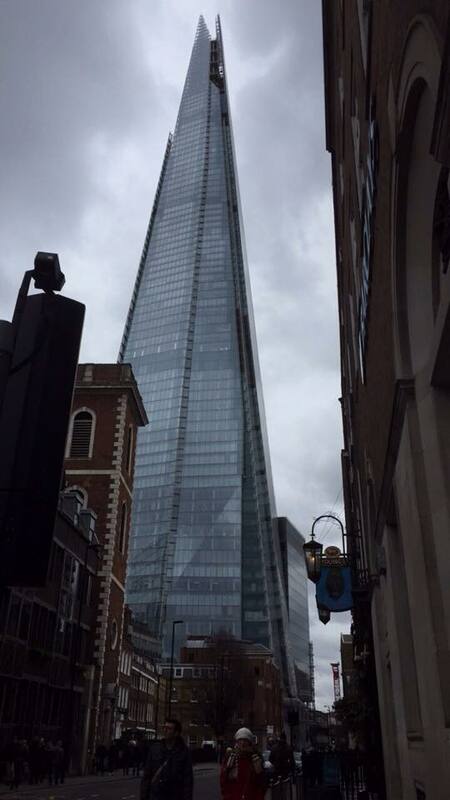 The Shard stands at 310 metres making it one of the tallest buildings in western Europe. We also saw the iconic London Bridge which is now a renovation of the original 600 year old bridge. You may have heard of the bridge from the popular nursery rhyme “London Bridge Is Falling Down.” On our way to Liverpool Street station we saw another one of London’s famous buildings, the Gherkin or more formally known as 30 St Mary Axe. The Gherkin is a commercial skyscraper in London’s primary financial district. Its unique, bold and energy efficient design has won the Gherkin many awards including the Stirling Prize, the London Region Award, and the Emporis Skyscraper Award. This trip to London saw me try my first ever red velvet cake. But not just any red velvet cake, I had the famous Hummingbird’s red velvet cupcake which is said to be the best in UK. 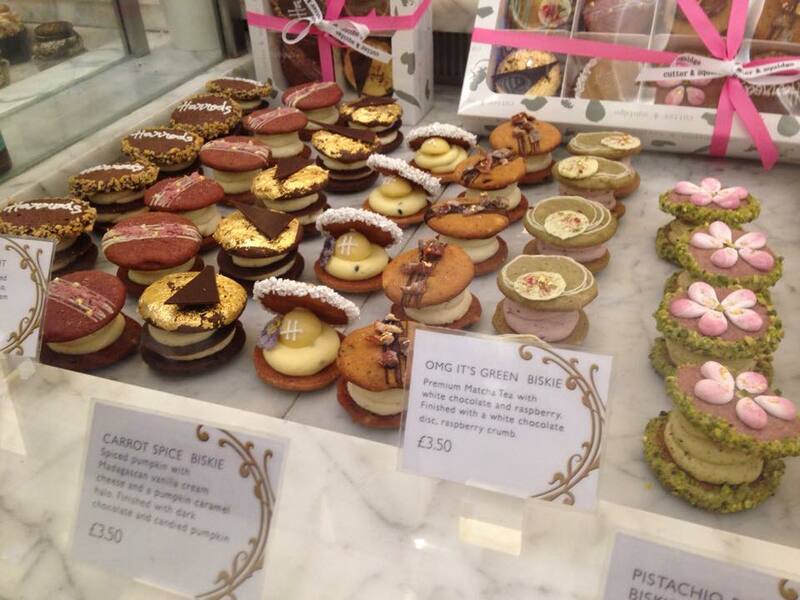 After a filling lunch in Covent Garden we walked to SOHO in search of a Hummingbirds to satisfy our dessert cravings. 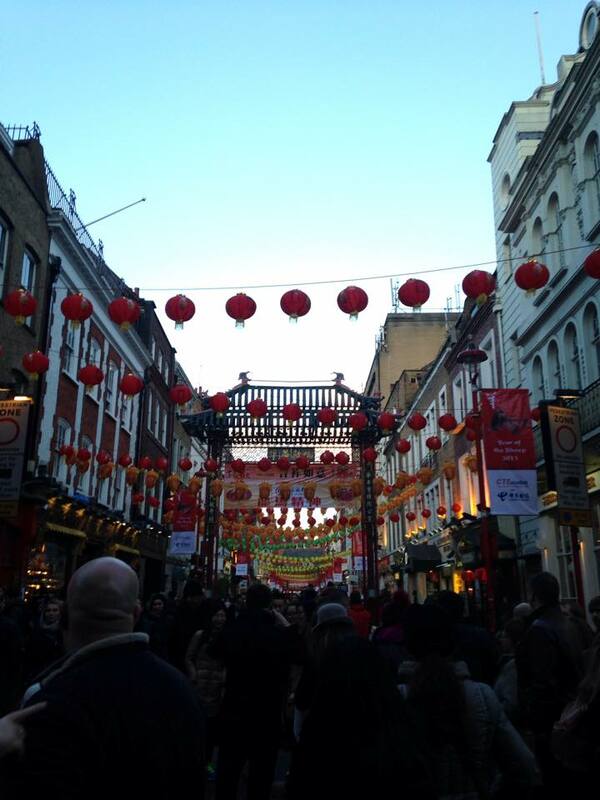 The journey took us through China Town, which was full of people celebrating the Chinese New Year! There was a great atmosphere with children and adults alike waving paper dragons and singing traditional songs. 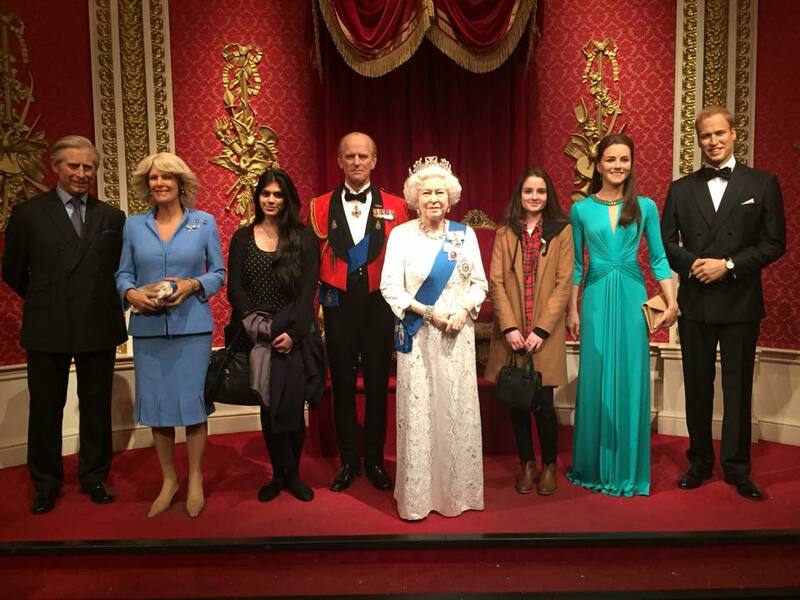 Here’s their website: https://hummingbirdbakery.com/ On our last day Rav and I went to Madame Tussauds which is a museum known for recreating life size wax models of celebrities. We got tickets for £24 each as we made sure to book in advance, tickets are normally a bit more expensive. Some of the models are uncannily lifelike and others not so good, but the experience overall is a lot of fun! We were lucky it wasn’t too busy when we went at 6 pm, as it is notoriously always overcrowded with tourists and getting a photo becomes an hour long ordeal with queues forming. Here’s some pictures of Rav and I being absolute legends in the museum.